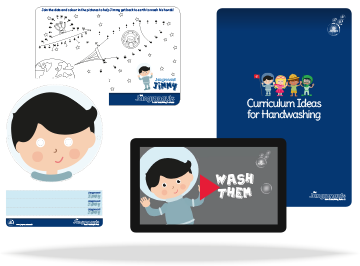 Introducing the Jangronauts, hand washing heroes, designed with children in mind. From schools to nurseries and restaurants to shopping centres, they bring a smile to any washroom. 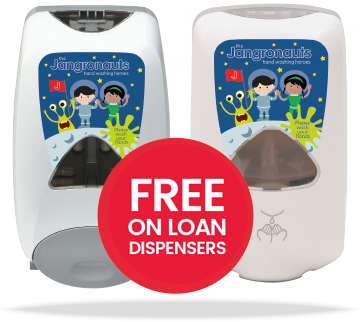 Click below to find out more about your FREE on loan dispensers when you purchase soap cartridges. Watch the Jangronauts teach you how to become a hand washing hero in our educational video. You’ll have fun along the way and you’re guaranteed to be whistling along by the end! Follow the adventures of the Jangronauts, hand washing heroes in our colourful and interactive story as they venture through space, fly away in the skies, explore the safari and dive under the ocean always remembering to wash their hands along the way.